The time has finally come. We finally have made Minecraft's biggest modpack and released multiple versions! This modpack is in 1.12.2 and contains more than 500+ mods! (We have discluded coremods and libraries. If we included them, then we would have around 530 total mods. This modpack will be constantly added mods, so we can satisfy our users. We will also take suggestions for resourcepacks, add-ons, and modpack improvements. You can do so by joining our discord (link on the bottom) and chatting in the #suggestions tab. We will also help with bug reports and problems loading or playing the modpack. We will try to help to make this modpack your best experience. RAM: Around 11 - 12 Gigabytes DDR3 or DDR4 RAM. GPU: We recommend you to have a 1050ti or an equivalent graphics card! Java Version: Java 8 is recommended. Keep in mind that updating to Java 9 or Java 10 may cause crashes/issues. I will not read any support comments for this thread. You can either join our discord and tell us the issue in the bug reports or support section, or you can email us at: [email protected] If you fail to meet these procedures, your message shall be ignored and not answered. If you need any help with installing this modpack, read the "README.txt" file. We might be posting a published modpack on Twitch. Also, because of the many mod conflicts in this modpack, F7 shows/hides the in-game options screen and F9 clears the modpack's error messages. -Fixed Major and Minor Bugs. 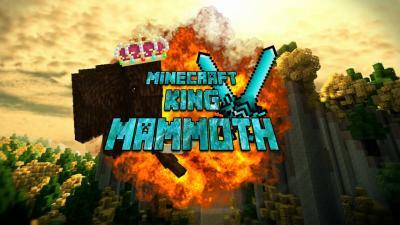 -Edited the resource folder so there will be King Mammoth icon when you are loading forge or if you are on the title screen. -There are probably many mod conflicts. This is common for most modpacks, because many mods interfere with each other. - Can't add JEI into the pack, so we must use the In Game Wiki mod as a subsitute. Please read the following license below. 1) When you take hold of our work, do NOT copy any work we have made. 1a) Do NOT just copy everything we have done. This includes, but not limited to: * Copying custom mod configs we have made to take advantage to our modpack. * Copying scripts such as the ones we use from Crafttweaker to tweak recipes and improve the modpack. * Copying images and resource files we made without permission. * Copying quests we have made to improve your own modpack. * Going onto repost websites such as 9minecraft to repost a modpack without permission. * Selling our modpack files onto illegal websites to earn money. 1c) Modifying the original work to contain hidden harmful content. We will not tolerate such things, and we report your modpack. 2) Outright copyright infringement. We also trademarked our name. You are NOT allowed to just copy our work and change the name. We will experience bad consequences. 3a) Reporting an issue and telling us the fix to it. This is not considered modifying our files illegally, because you are helping us. 3b) Opening a pull request. We will also accept these requests if they help us while developing the modpack. 4) There is a reason why the code is provided with no warranty. If you use someone's code and "lie" when it goes wrong, you could experience consequences. Fix the problem yourself. You blaming someone will just make the situation worse. 5a) We may file a DMCA file takedown request to take down your file. This may result in your work being taken down. 5b) We may report your modpack for copyright issues because of you inappropriately not following our license. This may also result in your work being gone. 5c) If you are in our discord server, we will either kick or permanently ban you depending on the severity of the problem. Please put the link of this forum in your signature. It spreads the word and lets other people know about this hard worked modpack. Note: This modpack is compatible with the latest version of forge. Use version 14.23.5.2808 for this modpack to run. Also please download the latest version of the modpack. It will solve most of your problems and modpack errors. I thank the former Co-owner, BomberCost, Lord514, LeSwagMaster, and SuperNovaGamer for helping me create this modpack. Thank you guys, for making this possible! Sorry for the late reply. Thanks man! Planning to add scripts to the modpack. If anyone would like to apply for a tester in the modpack, please dm me on discord by joining the discord server. More testers are appreciated! This is a new modpack and we need to find bugs! If anyone here is experienced in making quests for a modpack. Please dm me on discord by joining the discord server. We would like to implement quests into the modpack. Thanks.